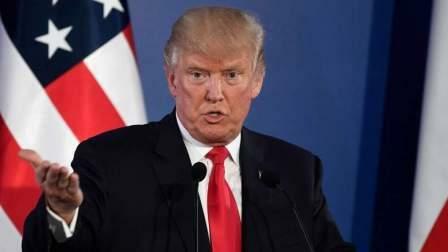 The Trump administration slapped 18 Iranian individuals and groups with sanctions on Tuesday for aiding the country's non-nuclear weapons programmes, in a bid to show that President Donald Trump is staying tough on Iran despite his moves to let the nuclear deal stay in place for now. The latest attempt to clamp down on Iran's military financing ranged from an Iranian-based company that aided the country's drone programme to a Turkey-based provider of naval equipment and a China-based network that helped secure electronics for Tehran. The sanctions freeze any assets in the US and prevent Americans from doing business with them. Treasury Secretary Steven Mnuchin said the sanctions "send a strong signal that the United States cannot and will not tolerate Iran's provocative and destabilising behaviour". "This administration will continue to aggressively target Iran's malign activity, including their ongoing state support of terrorism, ballistic missile programme, and human rights abuses," Mnuchin said. The announcement came only hours after the Trump administration told Congress for a second time that Iran is complying with the nuclear deal and can keep enjoying sanctions relief. The administration insisted Tehran was breaching "the spirit" of the deal.